This entry was posted in Felt, nuno felt, workshops and tagged Clasheen, Felt, felt workshop, Felting, nuno felt, nuno felt workshop, nuno felting, wet felt, wet felting by Nicola. Bookmark the permalink. A lot of food for thought here. I have een experimenting with cutting out shapes from prefelt to incorporate into design. It seems so obvious now but i only tried it in December. I have the same apple green nuno gauze. I tried it on a larger piece first and it was my first ever attempt at Nuno, still unfinished. Now that I have worked with silk this past two weeks and had some good outcomes i may try it again. Love your piece, and thank you for giving me some more ideas. Hope the weather is kinder to you soon. The organic shapes in the nuno are lovely. I love this idea, and it makes the cost of needled pre-felts worth a try. This project, and the one using cobbled-together pieces of pre-felt sheets means you can use the scraps and create more than one design. It could be used as the base fabric for sewing up a bag or clutch as well! The colours are wonderful and the process seems fairly easy for a beginner like me but all that rolling in the blind…I guess it makes for a good upper body workout ! I will pop over to flickr later on and see your photo’s . 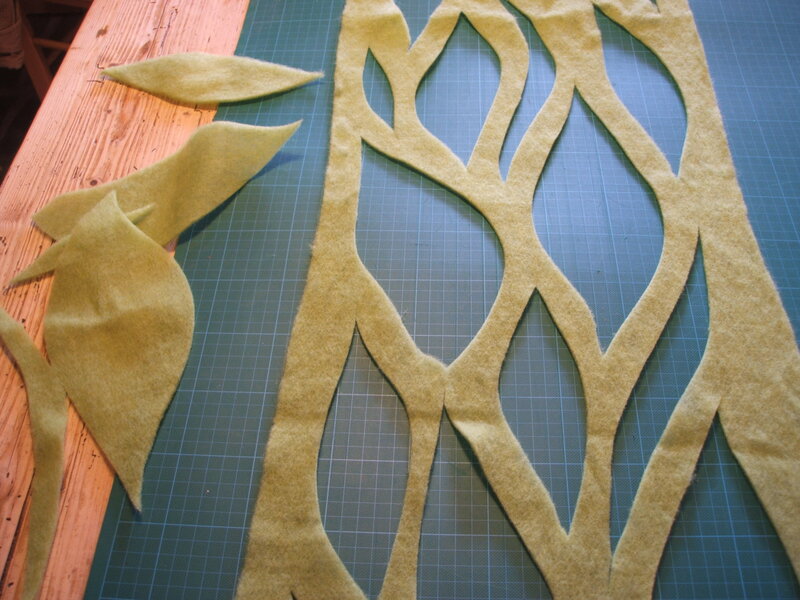 I woke up this morning with the idea that I want to do something simular with velvet–cut out pieces and nuno some merino into the gaps. Not sure if it would work for a full scarf but maybe broaches and smaller pieces….the colours would be lovely! I can barely wait to see this piece and you, once again, inspired me–hope I can follow through but none the less will sketch out some ideas in my journal. I have a window on each side of my front door–they are called sidelights (go figure). 7 years ago I did silk paintings for these windows. I coated them in wax as the silk was not drapery weight. I wanted a light weight silk so the light streaming through would resemble stain glass. After 5 years the sun finally made its mark and the fabric dissolved in my hand. 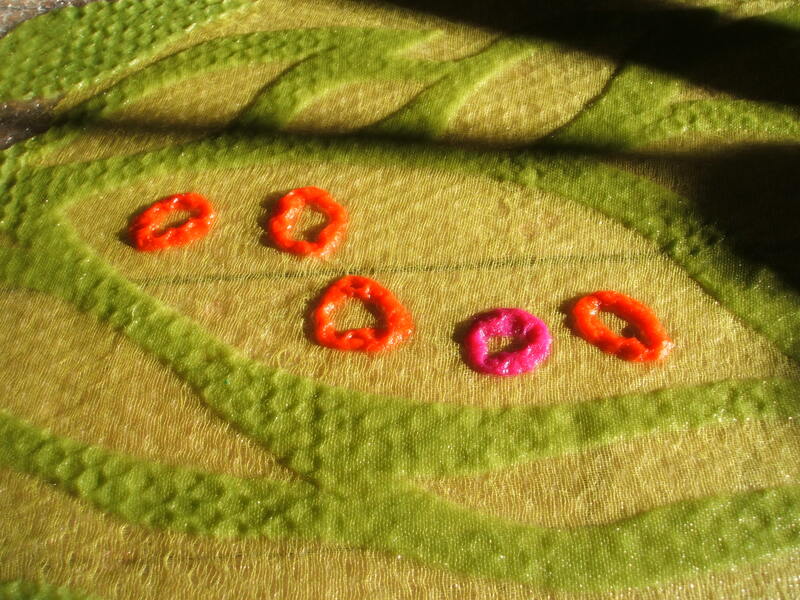 I replaced the silk with a pair of with cotton with hand paintedwhite circles in various sizes. This Nuno felt you described, although I have yet to see it, is stirring my imagination to create Nuno felted window covers. I will keep you posted if, and when this project flies. Thanks for the idea of hanging your new piece in the trees. I am thrilled to see your new piece. PS I am wondering if next time, the commercial felt is brushed with a wire brush or carders to lift the surface nap so the felting would go faster? You have the patience of a monk. How you did overcome all the bad wheather was a thought in my mind sometimes…you still are aliveandkicking fortunately. prefelt often is not so soft after roling. Silk is more soften too.